The project provides an approximately 1.2 kilometre multi-use pathway (MUP) along the Hospital Ring Road and extensive final landscaping within the new Alta Vista Hospital Link corridor. 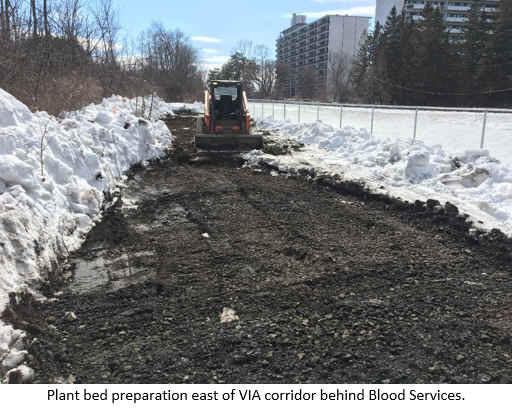 Work includes the construction of final landscaping throughout the Alta Vista Hospital Link from Riverside Drive to Ring Road, and a multi-use-pathway along the Hospital Ring Road connecting to Smyth Road to improved cycling and pedestrian connectivity to the area. In addition, a section of Smyth Road (170 metre length) from the Transitway to the east side of the VIA underpass, will be resurfaced with selective sections of sidewalk replaced. This work will also include a new retaining wall (27 metre length) behind the sidewalk along Smyth Road, extending from the southeast side of the VIA bridge, to improve drainage in the area. Construction is scheduled to take place until August 2019. Work areas will change as operations are initiated and completed. Read on for important construction updates. Over the next month, neighbours can expect a low level of dust, noise, vibration and construction traffic. The Alta Vista Hospital Link facility is open to vehicular traffic and emergency medical services on Riverside Drive, the Transitway, Alta Vista Drive, Hospital Ring Road and Hospital Link Road. Preparation for plant beds and tree pits will continue for the extensive landscaping throughout the new Alta Vista Hospital Link. This includes areas near Realigned Riverside Drive, the Transitway, the new culs-de-sac on Old Riverside Drive, Alta Vista Drive, near VIA Rail Corridor, and Link Road. Planting on the cul-de-sac slope in front of 1725 Riverside may commence. Planting in plant beds areas is expected to start mid-April near Link Road between Alta Vista and Hospital Ring Road. Clearing through the community walking trail south of Knox Crescent is complete. Mulching and spreading may commence this month, weather dependent. Temporary snow fence and straw bales for the toboggan hill will be removed early April. No work associated with the Multi-Use-Pathway is expected for the April 2019. Site servicing for drainage will be done on Roger Guindon and the East-West connection road in April. Preliminary work on Smyth Road will commence southeast of the existing VIA Rail bridge, west of Alta Vista Drive. Temporary sidewalk closures are expected when this work is underway. Pedestrians are reminded to obey all temporary construction signage and detours. There will be no weekday lane or lane-width reductions on Riverside Drive and Alta Vista Drive during peak or off-peak times. Motorists are reminded to obey reduced speed limits within construction zones and exercise caution when driving through active construction sites. Motorists are notified of changes to traffic patterns using Portable Variable Message Signs. Pedestrians are reminded to use exercise caution when traveling in construction areas and obey all temporary signage near landscaping construction activities. Short term sidewalk closures are expected on the south sidewalk on Smyth Road from Alta Vista Drive to the Riverside Hospital General Campus driveway entrance. Pedestrians will be detoured to use the north sidewalk. Temporary sidewalk will be maintained during construction period. All other sidewalks are open to pedestrians and maintained by the City. There will be no impacts during peak hours on the Transitway. There is no weekend or night work anticipated over April 2019. All night work is subject to the approved Noise By-law exemption. Residents in close proximity to the work will be provided with advance notice when night work is required. The following pictures are provided for information. The project provides a link between Riverside Drive and the Transitway to the Hospital Ring Road. This link is needed to improve transit service to the Hospital Complex and support ongoing hospital and local development including the NDMC Lands. The Hospital Link will comprise of a 2?lane facility with provisions for transit lanes and multi?use pathways. Substantial completion – Fall 2017. Separate landscape contract to commence in 2018. Welcome to this Public Open House for the Hospital Link. Representatives from the City of Ottawa and the Councillor’s office are here to answer your questions. Bus volumes do not warrant the provision of a separate transit facility to the Hospital Complex. The design can accommodate a future rapid transit link to the Hospital at this location based on future transit needs. The City can change aspects of the road design/operation up to the time of construction. The overall landscape and design intent for the Hospital Link is to integrate the existing natural features of Riverside Drive into the new corridor and create a seamless transition between the two roadways. The current landscape features include recreational pathways, open spaces within naturalized woodlots and open meadows. The proposed landscape within the Hospital Link intends to expand and strengthen these key components by providing additional multi?use pathway connections to the adjacent communities. Protection of the existing landscape features, including the provision of multi?use pathways along the Rideau River. Enhancement of natural corridors with additional reforestation, shrub, riparian buffers and specimen plantings. These include 425 proposed nursery stock trees, as well as 1,643 reforestation 'whips/ trees' (vary from 1.0 to 2.5 meters in height). Tree planting to enhance views and to screen the corridors from the adjacent communities. Woodlot restoration including the removal of dead ash trees. Enhanced pedestrian environments, including connected and accessible 3.0m?wide multi?use pathways along the entire corridor as well as a 2.0 metres wide sidewalk on the Hospital Link bridge over Riverside Drive. Provision for formal community connections to Knox Crescent, Hospital Ring Road and The Ottawa Health Sciences Centre (3.0 kilometres of multi?use pathways included in the design). Construction of new road bed, road surface, multi?use pathways, street lights and landscaping. Construction schedule updates will be provided at the City's web site, ottawa.ca. In Summer 2001, the City of Ottawa initiated an Environmental Assessment Study for the Alta Vista Transportation Corridor (AVTC). The AVTC is a tract of land owned primarily by the City of Ottawa, and designated in the former Region of Ottawa-Carleton Official Plan and in the current Ottawa Official Plan for transportation purposes. As shown in the figure below, the Corridor runs north and west from the Walkley/Conroy intersection to the Nicholas/Highway 417 interchange. The Alta Vista Transportation Corridor EA has proven to be a complex exercise in balancing the technical and public aspects of the project and the diverse opinions expressed by the communities affected. Over the course of the study, there has been significant effort and consultation to bring the study to this stage. The major aspects of the study, as listed below, are briefly described in this Summary section of the Environmental Study Report. The technical analysis supporting the City’s Official Plan (OP), Transportation Master Plan (TMP), and the analysis conducted throughout this study, concludes that additional transportation capacity in the AVTC is needed. Approvals for growth and development of communities such as Riverside South and Leitrim were based on the assumption that the transportation facilities (rapid transit and roads) identified in the OP and TMP would be in place – including the AVTC. The TMP identifies when various sections of the AVTC are required to be implemented. In the short term, capacity is required to facilitate the development of the Health Care Node located along Smyth Road. In the longer term, a connection north to the Queensway and south to Walkley Road both provide important links needed to maintain, what is considered and documented in City policies to be, acceptable levels of service and connectivity. A more localized view of existing and future road and intersection capacity in the Alta Vista/Smyth area related to planned growth at the Smyth Road Health Care Node, the Train Yard Lands and NCC lands located north of Hurdman Station. Firstly, with regard to the Southeast Sector as a whole, this analysis demonstrates that the current levels of service/congestion are approaching critical levels. The projected year 2021 conditions indicates that even with the implementation of a broad range of travel reducing strategies, with the achievement of higher transit modal share targets and with increased overall road system efficiency, there is still the need for a considerable amount of additional transportation infrastructure throughout the Southeast Sector. Secondly, with regard to the Walkley and Smyth Screenlines, which include the AVTC, specific analysis of future transportation needs north of Walkley Road indicated the need for additional transportation capacity/infrastructure across the Walkley and Smyth Screenlines to address the transportation needs of the Southeast Sector by the Official Plan horizon (2021), and that this infrastructure is only part of a larger package of transportation-related solutions for this sector. The alternatives to address the projected deficiency both inside and outside the AVTC range from a transit-only solution, to various transit/road combinations to road-only solutions. Thirdly, with regard to the more localized needs on the vicinity of the Smyth Road Health Care Node, there is an imminent and identified need for additional transportation system capacity in the section of the AVTC from Smyth Road to Riverside Drive, regardless of the outcome of the environmental assessment for the AVTC as a whole. For example, should the EA conclude that the appropriate solution for the AVTC as a whole is the “do nothing” alternative, there remains a previous and current demonstrated need to provide additional road capacity and transit service in the section of the AVTC from Riverside Drive east to Smyth Road. Attainment of a 30 per cent transit share of overall travel in the afternoon peak (the new OP’s target) will result in the projected transit modal split at individual screenlines in the Southeast Sector being within the range of 50per cent to 32 per cent, from north to south. This compares to the 40per cent to 15per cent range of target transit shares for 2021 that were established in the 1997 Regional Official Plan. Even with the attainment of the above-noted increased transit modal splits at individual study area screenlines, a considerable amount of residual travel demand remains that will require additional roadway capacity within the Southeast Sector. Specifically, the additional arterial road infrastructure identified as necessary by 2021 in the Southeast Sector includes the widening of each of: River Road/Limebank Road, Albion Road and Bank Street across the Leitrim Screenline, the widening of Conroy Road to six lanes, the twinning of the Airport Parkway across the CNR East Screenline, and the provision of additional arterial capacity north of Heron/Walkley through the study area sufficient to accommodate 1800 vph in the peak direction. There is a significant projected capacity deficiency across the Rideau River Central Screenline that could be partially alleviated by additional road capacity linking the Southeast Sector across the Rideau River to the Queensway and beyond. Rapid Transit Only: This solution took the form of either laying tracks in the corridor for a rail-based technology or building a two-lane transitway. Stations would be developed at appropriate locations for walk-in and drop-off of passengers, for park-and-ride lots, and for vehicle access in the case of a transitway. Roadway Only: These solutions provided capacity for all vehicles (private and transit) by building either a two-lane or a four-lane roadway from the Conroy/Walkley intersection north and west to the Queensway (Nicholas interchange). The two-lane roadway option is a shared facility for all vehicle types. Variations of a four-lane roadway had four lanes for general traffic, or two lanes for general traffic and two lanes for HOV usage, either all day or during peak periods only. Hybrid Solutions: Either of the foregoing rapid transit solutions could have been combined with a two-lane (or four-lane) roadway giving a high level of service for both transit and private vehicles. A four-lane roadway could also have been developed with two lanes for general traffic and two bus-only lanes, thus providing extra capacity for private and public vehicles. Do Nothing: No transportation facilities would be built in the Corridor but with the necessary additional transportation capacity either provided outside the AVTC or not at all. There are, however, plans for a recreational pathway in the AVTC that could be implemented independently. If the Corridor were not to be used for transportation purposes, its future use could be the subject of a detailed land use study to determine the best use of the land for the achievement of the Smart Growth objectives of the OP. Rapid Transit Only: There were three options for a rapid transit solution outside the Corridor. The first entailed the extension of the existing Southeast Transitway and/or the O-Train south of the Hunt Club Road to the Airport and the Riverside South/Leitrim Communities. The second alternative entailed the development of a rail-based technology in the existing abandoned railway corridor extending from the Hurdman/Train Station southeasterly paralleling the Highway 417 corridor to south of Walkley Road and then following the CN/CP Railway/Hydro Corridor westerly to the Southeast Transitway/O-Train corridor. An alternative to this which is both within and outside the Corridor is the development of a rapid transit facility extending from the Hurdman Station south to the AVTC Corridor, then extending east along the north limit of the Hospital Complex, through the Perley Hospital site and along the south side of Innes Road to the above-noted Highway 417 corridor to join with the possible Cumberland Transitway Corridor, which has not yet been finalized for the section west of Blackburn Hamlet. Roadway Only: The provision of additional roadway capacity for general traffic could have been achieved outside the AVTC corridor by widening any one or more of the following existing roads north of Walkley Road/Heron Road. Russell Road/St. Laurent Boulevard/Tremblay Road. Hybrid Solutions: Combinations of both the rapid transit and roadway only solutions outside the corridor could have provided additional capacity for both private and public transit vehicles. As an early priority in the EA, a study of transit in the Southeast Sector was conducted. The resultant report “Evaluation of Transit Alternatives, March 2003” gave consideration the City’s 2021 OP growth projections and applied the OP’s new transit modal split and Transportation Demand Management (TDM) targets. The transit study addressed the various combinations of rapid transit and supporting surface buses to best accommodate the Southeast Sector’s projected 2021 travel needs. With regard to north-south rapid transit, both the O-Train/Southeast Transitway Corridor and the Alta Vista Transportation Corridor were evaluated to determine how to best extend rapid transit service to the southern growth areas and how to best maximize transit ridership for the dollars spent. The study concluded that the extension of the O-Train/Southeast Transitway Corridor was by far the best corridor for north-south rapid transit for the Southeast Sector, and that the AVTC should not be recommended for north-south rapid transit. Concurrent with the transit study, the City was conducting the Rapid Transit Expansion Study (RTES) and the TMP as input to the Official Plan. Following extensive study, both the RTES and the TMP recommended the extension of the O-Train Corridor as being the best corridor for north-south rapid transit in the Southeast Sector (along with the Southeast Transitway). The City’s OP incorporated these recommendations. Consideration was also given to how much the transit ridership would have to increase above the OP’s 2021 targets in order to absorb the projected surplus north-south travel demand of 1800 vph in the peak direction so that there would be no deficiency in the area’s north-south road network across the key study area screenlines (i.e., no road required in the AVTC). It was determined that the percentage of transit across the Walkley-Heron and Smyth Screenlines would have to increase from the current 16per cent (2,420 transit riders) up to 57per cent (13,000 transit riders), and from 30per cent (2,100 transit riders) up to 60per cent (6,475 transit riders) respectively. The proposed transit system has the capacity to accommodate these increased riders, however, the issue is not one of transit system capacity, but one of how much of a transit modal split and/or increase in transit ridership is a realistic target on which to plan the City. As the study team believes these are unrealistically high levels of transit ridership compared to existing and to targets, it was appropriate to proceed with identifying, assessing and evaluating alternatives to accommodate the aforementioned projected surplus of 1800 vph. Selection of Preliminary Preferred Alternative. On-road cycling lanes in each direction. Following the initial identification of the preliminary preferred alternative, a sensitivity analysis was undertaken to determine which of the criteria categories most affected the ranking of alternatives and if the category weighting were changed, how would the rankings change. When the value of the Social, Economic, Biological and Physical criteria grouping was reduced from its weighted value of 0per cent such that the criteria had no impact, alternative 3 continued to rank 1st. Only when the Transportation criteria grouping was reduced from 39 per cent to per cent, did the first place ranking change. For this scenario, Alternative 1: Do Nothing ranked 1st, Alternative 2: a two-lane road ranked a close 2nd, and Alternative 3: two all-purpose lanes and two HOV/bus lanes ranked 3rd. The ranking under this scenario is understandable given the significant influence (39per cent) that the transportation criteria have on the ranking, and when given a value of 0per cent, those alternatives that do the least to address the projected transportation network deficiency would logically rank highest. In summary, the sensitivity analysis supported the selection of Alternative 3, 2-all-purpose lanes and 2 HOV/bus lanes, as the preliminary preferred alternative. Following the presentation of the evaluation results and the preliminary preferred alternative to the Transportation Committee in May 2004, the Committee directed the Study Team to re-evaluate the alternative solutions with the addition of a bus rapid transit alternative included. The study team subsequently developed the seventh alternative solution, which would be a bus-based Transitway running from the Southeast Transitway through the AVTC to the East-West O-Train line south of Walkley Road. The rationale for this alternative stemmed from the possibility that the Hospital Rapid Transit link, which is under appeal, could be removed from the Official Plan. As such, a transit rider, coming from the east, wishing to access the Hospitals would ride the East-West LRT to a station at Conroy, transfer to a BRT facility extending north to and through the Hospitals. The bus would then have the opportunity to connect with the Southeast Transitway. The entire re-evaluation process, including this alternative, was repeated. A sensitivity analysis was also conducted to ensure consistency with the process and most importantly, provide an understanding of the acceptability of the transit only alternative. The results of the re-evaluation process generated similar results. (Alternative 3) 2-lanes for regular traffic and 2-lanes for HOV/buses continued to be the preliminary preferred alternative. The transit alternative ranked 4th primarily due to its inability to address the future traffic demands as described previously. The Corridor is lengthy and was split into logical segments to narrow the focus on each section and resolve issues specific to them during the development of alternative designs. The four segments examined were the South Section (Conroy to Smyth), Central Section (Smyth to Alta Vista), Riverside Section (Alta Vista to Rideau River), and the Nicholas-Lees-Highway 417 Interchange Section. The following is a list of the common design objectives used in all sections. Between Walkley Road and Riverside Drive, the facility will be designed as a Scenic Route, as designated in the Official Plan. A preliminary preferred design concept was identified for each of the South, Central, Riverside and Nicholas/Lees sections of the Corridor. The preferred concept for each section was carried forward for further refinement, as appropriate, as the strategy for concept refinements benefited from a combination of further technical analysis and contributions from the TAC and PAC. The alignment in the area of the woodlot along the Rideau River was modified to minimize woodlot displacement and to minimize site alteration of flood plain and former landfill areas. For the locations requiring mitigation, noise mitigation options were considered to include 2 m to 4.5 m high earth berms, or 2 m to 2.5 m high noise attenuation fences, or a combination of the two. Resulting preliminary recommendations for noise attenuation, including proposed locations for berm and/or fence treatments, were determined. These mitigation recommendations were influenced by various factors including the noise forecasts, grade differences between the noise source and receivers, land availability, relationship to intersections at roadways and pathways, proposed community garden location opportunities, effects on the Hospital Woods and drainage requirements. It is important to note that in some locations in the South Section there is an opportunity to replace the noise attenuation fences with higher berms located either adjacent to the facility edge, or in some locations, adjacent to dwellings. However, to attain similar levels of noise reductions, such berms would need to be of heights ranging from 3.0 m to 4.5 m (as opposed to 2.0 m for fences), depending on location along the Corridor. When designed with acceptable 3:1 side slopes, such high berms would consume a wider open space swath and might be more visually obtrusive to the overall neighbourhood. However, these disbenefits might be counter-weighted by benefits to adjacent residents who may prefer a high berm to mitigate noise and visual impacts rather than a noise attenuation fence located on/near their lot line. The subsequent detailed design process for noise attenuation measures should include involvement of adjacent residents for reasons such as this. The preferred at-grade intersection designs respond to input from the Transit Services Branch (OC Transpo) of the City of Ottawa. At intersections where a bus stop is required, a bus priority design has been incorporated. This includes the development of a bus priority lane and bus shelter island on the near side of the identified intersections, adjacent to the HOV lane. This will allow buses to pick-up passengers without blocking traffic, as well as a priority signal phase (white vertical bar), when the signal turns from red. Additional benefits include less chance of transit passengers being splashed by passing vehicles, and no right-turning vehicles turning in front of buses. At these locations, a right-turn lane for traffic exiting the arterial will be located to the right side of the island. The Transit Services Branch has estimated that over a 20-year horizon, peak hour bus volumes in the peak direction would grow/range from approximately 12 to 30 buses per hour. It should be noted that this bus priority design adds significant width to the road facility. Another alternative that was considered was to combine the bus priority lane and the right-turn lane. This would reduce the overall road width at these intersections by 10m, at each bus stop location, reducing pedestrian crossing distances, and giving lesser priority to buses. Additional characteristics include greater potential for waiting transit passengers being splashed by right-turning vehicles, potential bus delays due to right-turning vehicles, delays to right-turning vehicles due to stopped buses and safety concerns associated with right-turning vehicles passing in front of stopped buses. Either alternative would provide a suitable level of service and safety for all modes. This is considered to be a choice that can be determined at the subsequent detailed design stage. Planting adjacent to natural areas that is non-invasive and that will emulate natural characteristics. Pleasant Park Road drainage across the AVTC has been included, again to increase the level of service downstream easterly. The Preferred Design for the AVTC shows the basic functional geometric design of the proposed facility. In addition to the facility’s geometric design, a demonstration of landscaping and noise mitigation measures, that are considered built-into the Preferred Design, are also shown. It is important to note that the landscaping and noise mitigation measures are shown as a conceptual demonstration, and would be subject to refinements at the detailed design stage. Participation of adjacent residents into the design of the landscaping and noise mitigation measures will be an important aspect during the detailed design phase. As previously mentioned, the need to conduct this EA at this time is due to the increasing development of the Hospital Area which will require major new infrastructure to accommodate the related growing travel demands and to minimize community impact. The TMP identified the required staging of the AVTC and stated that the section from Riverside to the Hospitals was needed in the first phase (before 2008). This, along with Council’s direction that only the funds required for this stage are included in the long-range financial plan, confirmed the link from Riverside to the Hospitals as Stage 1. The purpose of the Hospital Link in the AVTC is to provide a connection from Riverside Drive and the Southeast Transitway easterly to the Hospital Lands. This link is needed to improve transit service to the area and to accommodate projected growth in vehicle travel demand related to ongoing development of the Hospital Lands. As such, it would relieve pressure on the adjacent sections of Alta Vista Drive and Smyth Road, which are currently operating close to, or at capacity. As the intent of the EA process is for the initial phase of the AVTC to be compatible with the recommended design solution for the ultimate facility, the choices for the initial Hospital Link included: a link that will form a portion of the ultimate facility from Riverside Drive through to the Hospital Lands; and a link that is separate from the ultimate facility so as not to preclude its ability to be constructed if/when required. Due to the combination the recommended alignment of the ultimate design solution, the limited available right-of-way in certain locations within this section of the Corridor, the geometric complexities of passing under the railway tracks and over Riverside Drive, and the desire to minimize throw-away costs if/when the ultimate facility is built, it was determined the Hospital Link would form a portion of recommended ultimate facility. The recommended Stage 1 Hospital Link is the southerly two lanes of the ultimate four-lane design solution. The ultimate cross-section of these two lanes, which would be the future eastbound lanes, is 9.25 m comprised of a 2.0 m wide bicycle lane a 3.5 m outside vehicle (HOV) lane and a 3.75 m inside regular traffic lane. Initially, when these two lanes operate as the two-way Hospital Link, the 9.25 m will be divided equally, with each of the eastbound and westbound lanes being 4.625 m wide. This lane width is suitable for shared use (motorized vehicles and bicycles), while being entirely compatible with the ultimate cross-section. The two-lane Hospital Link will extend from the existing Hospital Ring Road west to a realigned Riverside Drive. It will pass over the realigned Riverside Drive, over the Southeast Transitway, across Old Riverside Drive (which will be cul-de-sac), underneath the CN rail line, and will intersect Alta Vista Drive and the Hospital Ring Road at-grade. 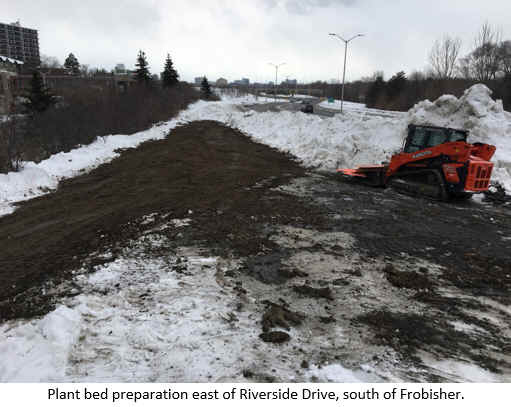 As it passes over the realigned Riverside Drive, connecting ramps down to Riverside Drive are provided at the existing Hincks and Frobisher intersections. In addition to the core two lanes, turn lanes will be required at intersections; bus ramps will be provided to/from the Transitway and bus priority lanes will be provided where appropriate. Appropriate noise attenuation and landscaping will also be provided. With regard to total construction costs in 2005 dollars, the Hospital Link is estimated to cost approximately $59M, and the Ultimate Facility is estimated to cost approximately $135M. Open House #3 and Public Meeting #2 –May 30, 2005 - alternative designs were developed based on the preferred solution. A thorough evaluation was conducted on the various alternatives based on criteria that can measure meaningful differences between the choices. Once this is complete, a technically preferred alternative will be identified along with any necessary mitigation measures and staging options. Over 500 signed in at this meeting. The output from the above-noted 21 September 2205 Transportation Committee were recommendations to City Council related to receiving the EA, to implementing only the Stage 1 Hospital Link at this time, and to the preparation of the Environmental Study Report for the 30-day public review, in accordance with the Environmental Assessment Act. Council, at its 12 October 2005 meeting, carried the recommendations.